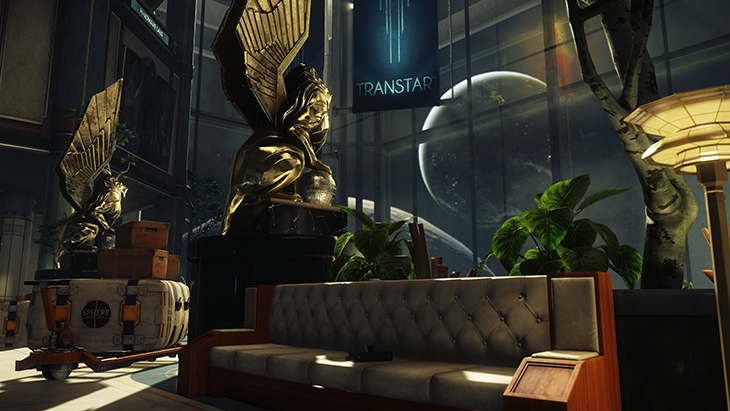 In Prey, every single thing in the game has a purpose and tells a story. With so much to see and do, one player may take a different path or use abilities and weapons in an entirely different way from another. 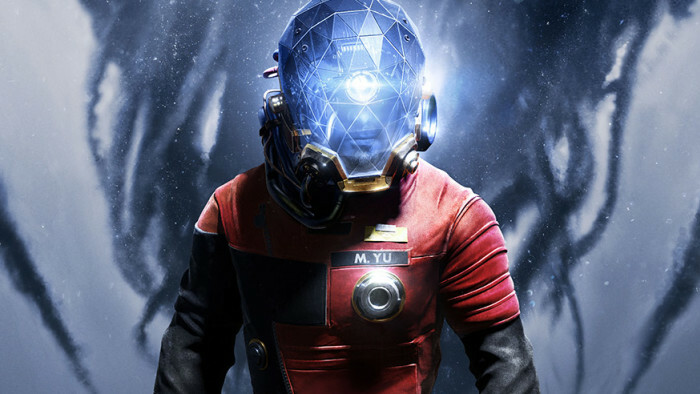 That’s OK, though – embracing Arkane Studios’ signature freedom of choice, Prey is meant to be experienced differently by different players. We recently handed the controls over to press around the world for the very first time and set them loose with the first hour of the game. (You can see some of their initial impressions here.) 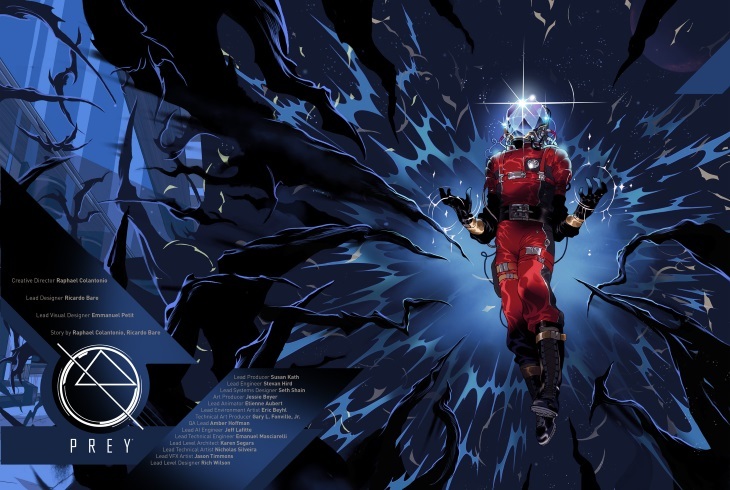 We also played through the beginning of Prey quite a lot, with the goal of uncovering as many details as we could. Here are 45 things we saw and did in just the first 15 minutes of the game. 1. Who Is Your Morgan? Before we began the game, we had to choose whether we’d be the male or female version of Morgan Yu. For this demo, we chose female Morgan. It’s Monday, March 15, 2032, and we’re in a ritzy apartment with an absolutely breathtaking view of a shining bayside metropolis. In the distance we can see the towering golden TranStar building, where Morgan will be starting her new job, working with her brother Alex. We don’t know much about Morgan yet, but she’s almost certainly very well-off, just based on the luxury around her. Near the bed is a workspace covered in a tinkerer’s clutter. It’s safe to assume Morgan is both brilliant and fond of working with her hands. Signs of Morgan’s life and family are littered around the apartment. A note from Alex congratulating her on her first day on the job. An email, also from Alex, explains that their parents won’t be able to be at the shuttle to see Morgan off because they’ll be in New York for “company stuff.” An austere family photo showing the Yu siblings and their parents. A framed newspaper clipping featuring Alex and Morgan is hanging on the wall by the bathroom. A magazine interview with Alex about TranStar’s work with something called Neuromods. In the interview, Alex claims these scientific revelations could turn someone into a mathematician of Einstein’s level in a matter of minutes. Next to Morgan’s bed is a document outlining the steps for Neuromod installation. Sticking a needle in our eye for five minutes doesn’t sound like our idea of a good time. Everyone needs to take a minute to unwind every now and then. Just from glancing around Morgan’s apartment, it looks like she chooses to relax with videogames. A controller sits on the coffee table and a copy of Galactic Conquistadors IX rests on a shelf next to the couch. There are strange skid marks on the floor of Morgan’s apartment and in the hallway outside her door. It looks as though something heavy was dragged across the ground, perhaps repeatedly. Morgan is headed for the Talos I research facility in space, but before she can hop on a shuttle, she’ll need to meet with Alex and undergo a series of tests “to prepare you for a life in orbit,” or so an email on her computer says. There’s a helicopter waiting for her on the roof of her apartment building, but she’ll need to don her new TranStar uniform first. Chatting with Patricia Varma in the hallway outside of Morgan’s apartment is an odd experience. What starts as a polite morning chat turns into a desperate attempt to get rid of Morgan after a few minutes pressing Ms. Varma for conversation. A pleasant “There’s a chopper on the roof for you” becomes a fearful, whispered “I can’t talk to you anymore” before she stops acknowledging Morgan’s presence altogether. There are even more of those strange skid marks on the way to the helicopter. Yes, you can jump into the helicopter blades and die, and yes, you do get a secret achievement for it. The helicopter isn’t a normal helicopter. It’s sleek and luxurious, with wide windows to allow for unobstructed views of the city and the beautiful bay. An Operator is the first thing to greet us once we hop off the helicopter and enter the building. This one is Science Operator, though different Operators will have different purposes and functions. 14. Ok, What’s Going on Here? More dark drag marks line the floor inside the TranStar office. What is being moved? We’ve got our older brother standing right there, so we have to mess with him, right? We started chucking a nearby flower pot at him repeatedly just to see how he would react. In typical big bother fashion we got a very frustrated “Why?” and “Would you stop that?” Fine, we’ll stop. For now. 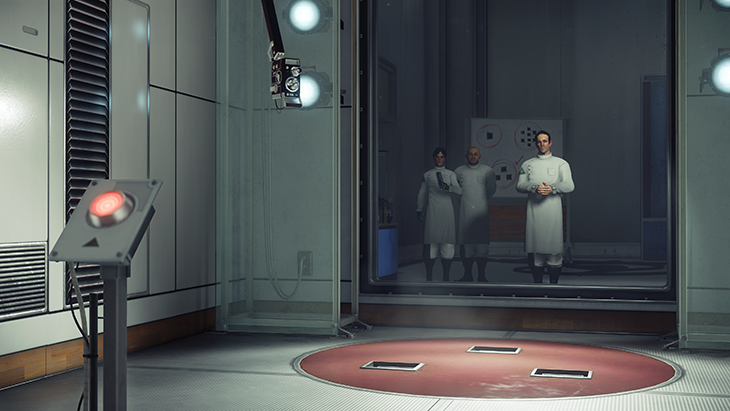 The tests are being run by a doctor named Sylvain Bellamy, and he seems concerned by the results as you progress. He gets progressively more irritated with every one we complete. After three physical tests, we’re led to a computer to complete a personality test. Rather than focusing on the screen like a good student, we keep an eye on Dr. Bellamy as he asks someone to fill his coffee cup, and we notice something very strange. As he’s talking to us, a black blur sweeps up onto the desk in front of him and suddenly there are…. two coffee cups in front of him. As he grabs the new addition, a horrifying creature latches itself onto his face and all hell breaks loose. Gas leaks into the testing room Morgan is in and she slips into unconsciousness. It’s Monday, March 15, 2032, and we’re in a ritzy apartment with an absolutely breathtaking view of a shining bayside metropolis. Wait… That can’t possibly be right. Yesterday was March 15, 2032, wasn’t it? Everything in the apartment is exactly where it was yesterday morning, as though someone came in and reset everything we previously moved around. Walking over to Morgan’s computer, we find it full of messages from someone named January warning us to get out the apartment. We slip into our TranStar uniform and head out of the apartment, only to be met by a horrifying scene. Patricia Varma – the woman we spoke with yesterday morning – is now a corpse on the floor, resting exactly where she was the last time we saw her. She hardly looks human anymore; her skin is grey and swollen, and a look of horror is stuck on her frozen face. We approach to examine Varma’s body and grab the wrench at her side, just in case whatever got her comes after us next. The same January that sent us those desperate emails is now calling us on our TranScribe (a personal data device given to all TranStar employees) to tell us we’re not safe. Following her instructions, we head back out into the hallway to see if we can find a way out. However, the path we took last time is blocked. A wall seems to have slid into place, closing off our exit. Well that certainly explains all those dark marks we were noticing on the ground. The walls seem to be capable of rearranging themselves to form new structures. Instead of stepping out onto a balcony, the glass shatters to reveal a lab. Littered around the space are all the items we’ve seen in Morgan’s apartment, which means someone probably did go into the apartment at night and reset everything we took or moved, just as we suspected. A chart at a computer in the lab shows a log of Morgan’s morning activities, though the date reads February 22, 2035, not March 15, 2032. There’s a yellow sticky note near the computer with the owner’s password jotted down. Keep an eye out for other notes like this. You’ll need them to access people’s personal files and unlock certain doors if you haven’t invested in your Hacking skill. The computer on the desk has a recording from Alex. It’s the same exact message we heard the morning before when he called Morgan to congratulate her on her first day. If that was a recording, does Alex know about Morgan being monitored and studied? As we push on through the eerie, empty labs, a pizza box we pass by suddenly leaps into action just like Dr. Bellamy’s coffee cup did. We swing wildly with our wrench until the creature is a mess of goo on the ground. 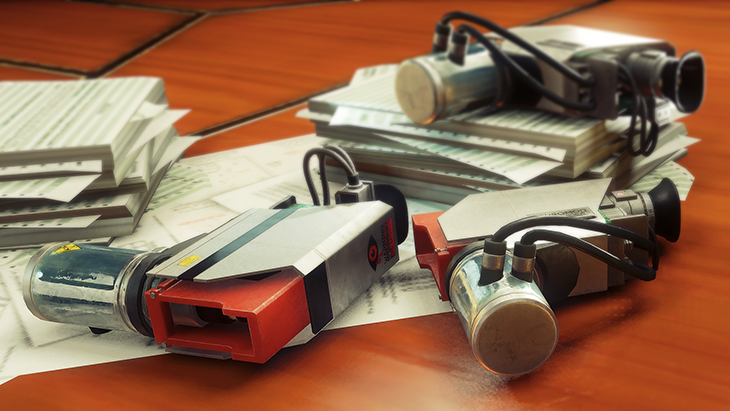 We’ll need to be on the lookout for duplicate items in our environment from now on. We make it to the area that should have been the roof where the helicopter was, but now it’s just a dimly lit, half-assembled version of itself. There is no skyline. The chopper sits stationary in a large glass room. The glass looks just like the windows in Morgan’s apartment, which means it’s safe to say we never took any trips in this beautiful bird. It was all faked. On the other side of the room is the door to the TranStar building rooftop access. 33. Was Any of It Real? Stepping into what we had previously believed to be the TranStar building, we see a mocked up office setting in a state of disrepair. Sparks fly from the elevator, bits of the floor are rising and falling in jerky motions, as though trying to follow a track and meeting resistance. Whatever was causing the rooms to reset themselves is glitching out. Entering the elevator to get back to the testing area we were in before proves our theory correct. The door does not shut, though the sound of floors whirring by filters through speakers. We watch as the entire room shifts around to create the space where we met up with Alex the day before. 34. Ever Feel like You’re Being Watched? The testing rooms are locked, but the security booth we passed by yesterday is now open, and passing through allows us to see life from Bellamy’s side of the glass. The lab is dark and mostly silent as we poke through the scientist’s belongings. It’s only when we step past one of the testing rooms that we are startled out of our cautious search. An alien that had previously been disguised as a chair throws itself at the glass and breaks through. After we’ve taken care of the alien, January’s calls us on the TranScribe once more to tell us that we just encountered a Mimic, and it does exactly what the name implies. Fighting with a Mimic means keeping your head on a swivel. These nimble little aliens will leap and slide all around a space to get a better angle on you. They can stretch their bodies out to hit you from a distance, and they can retreat to take on a different form if the fight isn’t going their way. They will also travel in packs if they can, and you do not want to get surrounded by them. Heading back to our original path we make it to a decontamination room before hitting what appears to be office space. As we wait for the decontamination process to complete, a terrified TranStar employee throws himself at the glass in front of us, only to be quickly taken down by a Mimic and turned into a husk like Patricia Varma. As we watch, the Mimic that killed him splits into four separate entities and all four race off to hide in different locations. January calls us again to tell us this is how they were able to take over the station so quickly. Once they started multiplying no one could stop them. Searching through people’s computers will provide a wealth of information. 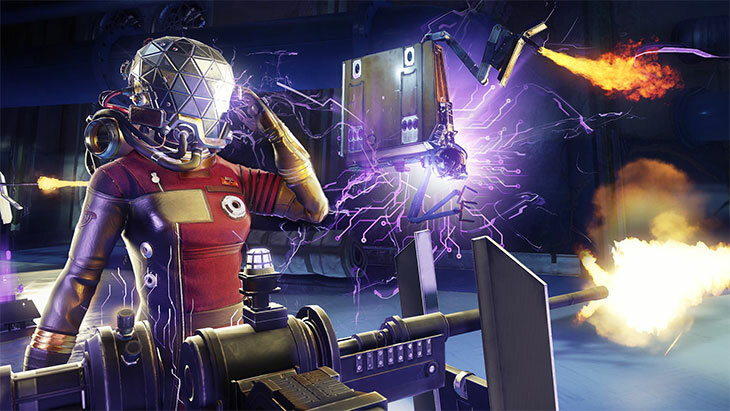 You might find codes to safes or doors, you might get a new side objective to complete, you might learn more about the situation on Talos I and the brewing suspicions among the TranStar employees. 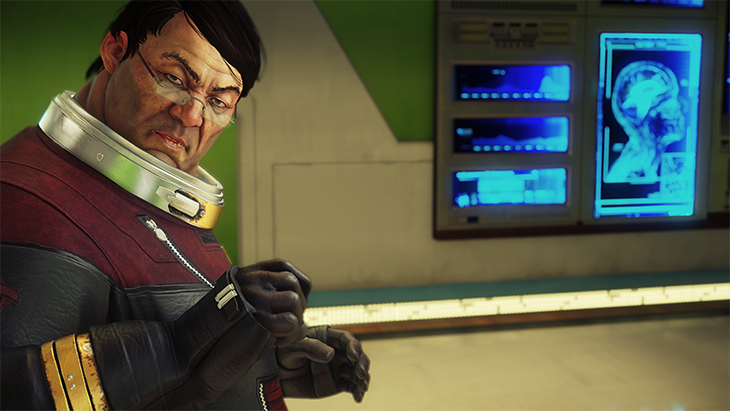 It pays to be a snoop in Prey. In one email we learn that every day, Morgan’s memories are reset back to March 15, 2032 – the day we believed it was when the game started. Where the Mimics are small and mostly pretty easily managed (unless a group of them catch you by surprise), the Phantoms are much larger and more humanoid, and certainly not to be taken lightly. We get our first look at these towering aliens when we exit the Simulation Lab and head into the Neuromod Division. We see it directly in front of us, standing behind a window. It’s only there for a moment before it blinks away and vanishes from sight, but a glimpse was all we needed to see that it wasn’t something we want to tangle with at this point. We round the corner into the Neuromod Division central lobby and find a corpse on the ground surrounded by strange hardened blobs. Sitting at the body’s side is our first real gadget (sorry, wrench, you don’t count): the GLOO Cannon. A stack of GLOO canisters are piled near the weapon and one more can be found by climbing up the tipped over tower next to the Security Booth and searching the corpse of the TranStar Employee who thought they would be safe by getting to higher ground. 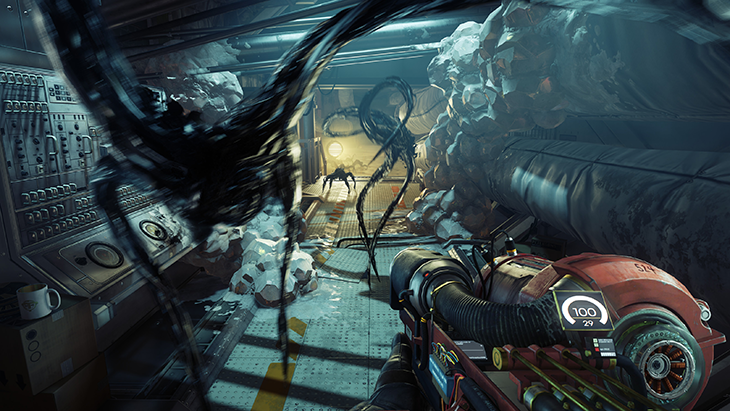 GLOO Cannon in hand, we don’t make it more than a few feet before a swarm of Mimics rush through the area. Some try to fight immediately, some try to hide and wait for a better opportunity to strike. 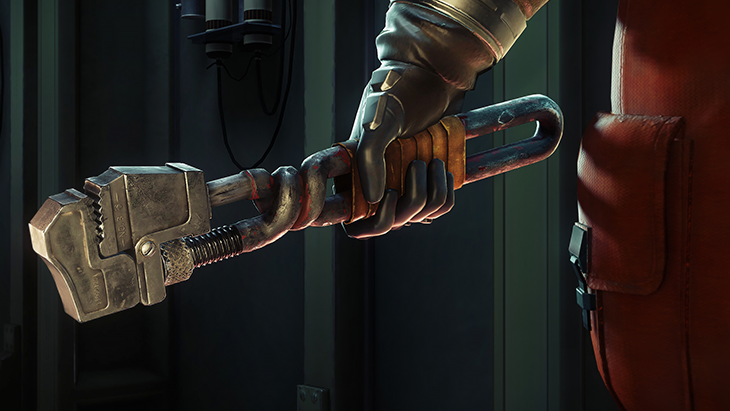 We make use of the GLOO Cannon to freeze them in place and shatter them with the wrench. Since we didn’t choose to invest in repair, we can’t get the grav lift working to take us upstairs. 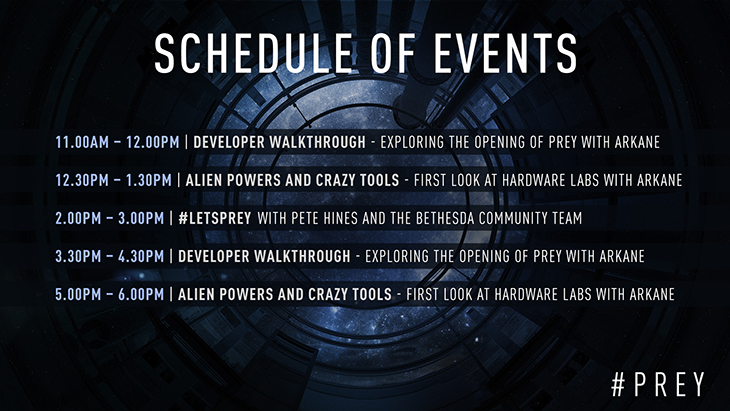 But in Prey, there’s always another option. We take our handy new GLOO Cannon and build our own ramp up to the second floor, where we find another new toy: the Disruptor Stun Gun, which will be handy against any enemy turrets or rogue Operator bots we run into. The GLOO Cannon and the Disruptor Stun Gun are great tools to have, but for some enemies we might want something a little more heavy duty. Lucky for us, there’s a shotgun lying next to the body of another unfortunate employee. Hopefully it will serve us better than it did him. 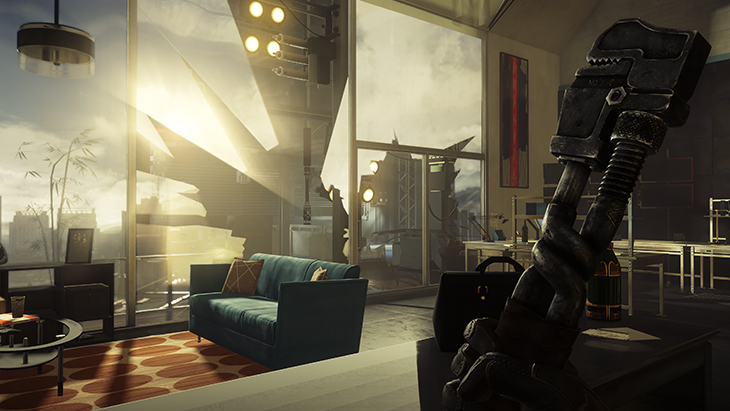 Just a few steps past where we found the shotgun and we get our first real glimpse at where we are, and it definitely isn’t a research facility located in the heart of a thriving metropolis. This is the Talos I space station, and that means we’re trapped up here with the alien threat and no real means of escape. From here, we’ll need to listen to January, keep our wits about us and just try to stay alive.